If you want a large beautiful picture in the daylight that will magnify and give high quality visual for your movie, gaming, or business presentation experience, then having a projector is a perfect choice. A home projector for daytime viewing is a very helpful tool both at home and in the workplace. A projector has the ability to display stunning visuals such as photos, videos, presentations, from a mobile device into a 100-inch screen. Luckily, many manufacturers have endorsed several brands and models of projectors that can be easily installed and set up, not hard to maintain, and can save a significant amount of money when compared to buying a large screen TV. There are a lot of projectors available in the market today that offer different features, different specifications, and different prices. The Epson Home Cinema Short-throw Projector gives you a superior viewing experience with its full HD resolution up to 10 feet diagonally. Imaging seeing sharp and life-size images while watching movies with your family. It has no shadows, no long cables, and no glare. For a modern and sophisticated entertainment solution, this choice is a top notch. 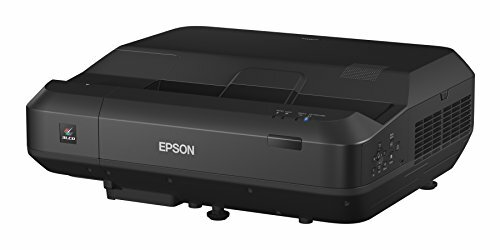 The Epson Home Cinema Short-throw Projector comes with an ultra-bright laser technology also known as the Epson Laser Technology that gives off 4000 powerful lumens of equal white brightness and color. It also features an extraordinary contrast of up to 2,500,000 to 1 best for deep blacks and vivid colors. It has an advanced 3-chip design that ensures no white segments, no color wheels, and no rainbow effect. The Epson Home Cinema Short-throw Projector can also be easily installed. It features a 3x HDMI ports that can allow you to unite all devices into one hub which offers versatile connectivity for satellite boxes, cables, and other streaming devices. This Epson Home Cinema Short-throw Projector is a perfect entertainment solution for your HD movies, sports, concerts, and more. The Optoma X600 Network Projector is a perfect choice if you want a powerful and brilliant presentation with its 6000 bright lumens and excellent 10,000 to 1 contrast ration. It offers amazing XGA resolution for presentations with sharp and vibrant colors, clear videos, graphics, and texts. It can easily adjust the level of brightness needed for a large or medium room such as classrooms, meeting rooms, or lecture halls. The Optoma X600 Network Projector gives impressive connectivity options such as the Crestron RoomView for up to 250 projectors over the network. Its CrestonRoomView feature can offer a configurable interface for managing and controlling every device in a room from a computer. It also has an RS232 command feature that can easily control the X600 by using any control system. This projector also comes with DLP technology which gives a BrilliantColor Technology for multi-processing of accurate colors that are projected on the screen. It has a multi-processing system that offers a six-segment color with an advanced dichroic coating which enables to achieve excellent color saturation for an extraordinary quality image. The Optoma X600 Network Projector is the best choice for large scale installations for educational and business environments. The Optoma X600 Network Projector is also eco-friendly as it uses less than 1-watt consumption of power when in standby mode. This gives a 75% savings power consumption compared to a regular standby mode. The Optoma X600 Network Projector can support multiple 3D formats from different devices such as Sony PS3, PC, Microsoft Xbox 360, Blu-ray 3D or 3D TV broadcast system. 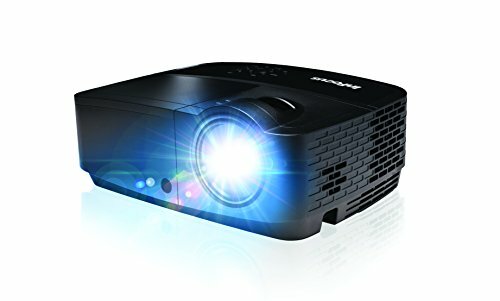 The InFocus DLP Projector is an incredibly affordable projector that can beam presentations and movies with its high-quality brightness. This amazing projector is designed to operate with an HDMI input with Brilliant Color Technology. Aside from being affordable, it is also lightweight and compact which allows you to carry anytime and anywhere for convenience. It boasts with top notch high-quality image and true-to-life projections from DLP technology with the InFocus Brilliant Color Implementation feature. The InFocus IN119HDx 1080p DLP Projector has a 15,000 to 1 contrast ratio that gives sharp blacks and whites on the screen. This project comes with different modes that are designed to give the best image quality when projected to a whiteboard, beige wall, blackboard, and other surfaces. The InFocus IN119HDx 1080p DLP Projector has 10,000 hours of lamp hours which do not require the owner to change the filters from time to time. Its Eco Blanking technology on its remote control lets you instantly control the dim of the screen and divert the audience’s attention directed toward you. This feature, when activated, lowers the power consumption up to 30% when the projector is not in use. This energy-saving feature can be very helpful if you want to save money from electric bills. The InFocus IN119HDx 1080p DLP Projector also supports multiple formats of 3D such as video games, 3D broadcasting, Blu-ray, and PC connections. All you need is to pair this with 144Hz Link 3D glasses which are sold separately in order to synchronize the image for a full and awesome 3D experience. Lastly, the InFocus IN119HDx 1080p DLP Projector is very compact and lightweight. It can be easily installed and moved from room to room. Projectors have become one of the must-haves for people nowadays. For those who have home entertainment theaters, a projector is a must have. By having one, you can experience a real-life cinematic performance. When paired with high-quality speakers, you can turn your living room into a cinema-like area that gives a spectacular viewing and listening experience. For those who work with presentations, a portable and lightweight projector is the best choice. You can bring it anywhere and anytime. For a daytime viewing experience, it is important to select a speaker that can adjust to its environment and display are and are able to project clear and beautiful visuals even when the surrounding is well-lit.